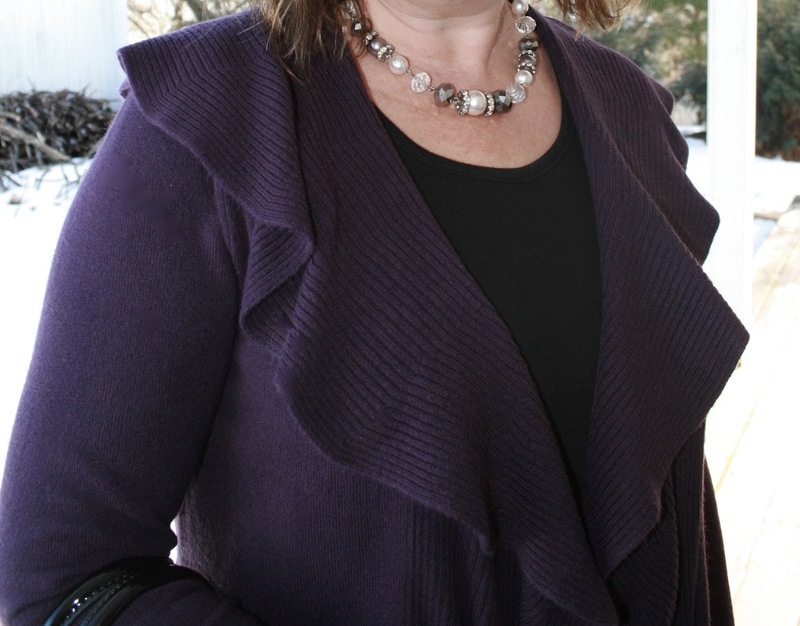 Amy's Creative Pursuits: Co-Hosting The Fabulous Friday Link Up with Jennie! 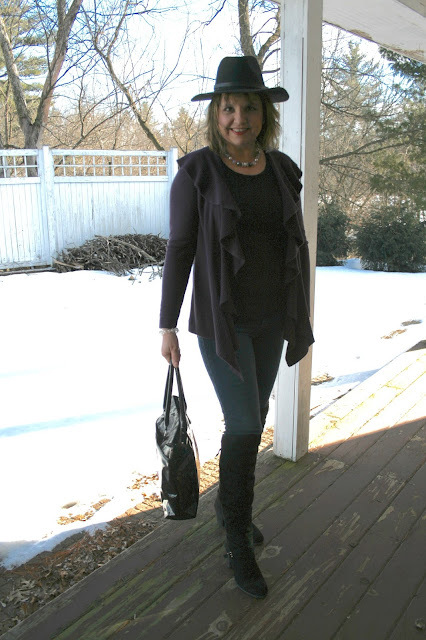 Co-Hosting The Fabulous Friday Link Up with Jennie! I'm so excited to be co-hosting the Fabulous Friday Link-Up with Jennie. She is one of my favorite style bloggers. Jennie not only has an amazing sense of style, but I love her because she is so supportive of others in the blogging community as well. I really wanted to have a nicer outfit to show for my co-hosting debut with Jennie, but I had one heck of a week! It was a challenge just to get dressed up and have these photographs taken. My husband and I started renovating our master bedroom and we have just been so busy. We hope to have the flooring installed and the new bed put together this weekend. The rest of the renovation should be a piece of cake after we had to do so far! So this simple outfit is all I have to show you. 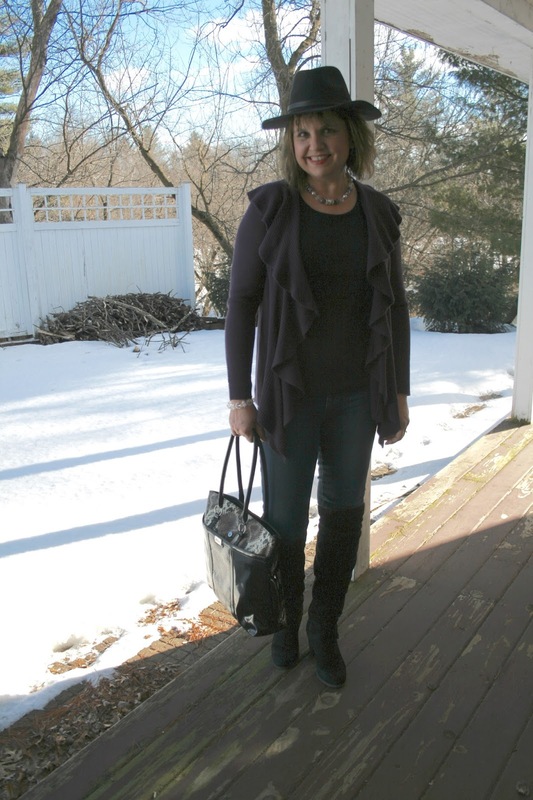 This is what I wore to church on Sunday, out-to-lunch, and then off to Ashley Furniture to pick up our new bed! When we got home, we scrambled outside quickly to take pictures before the sun went down! 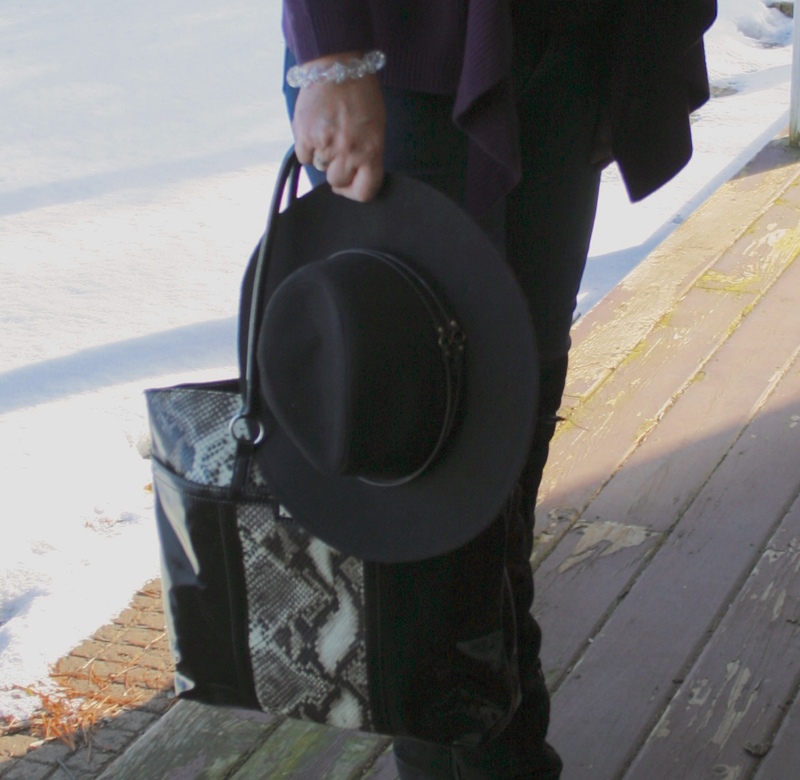 It's a simple outfit of straight leg jeans with a black tee shirt, a eggplant ruffle cardigan, black over-the-knee boots and a black hat and bag. I did try to jazz it up a bit with a clingy necklace and bracelet and a felt hat. Everything I have on is from last season or beyond besides the over-the-knee boots. They are by Madden Girl and I purchased them from Famous Footwear. My black tote is a mix of a snakeskin print and a solid black. My necklace is a mix of clear, white, and charcoal grey stones with a hint of crystals. I had to stand in the shade because the sun and snow were too intense. But then my flash didn't work for some of the pictures, that's why some pictures look much brighter and more focused than others. Like I said, we had a very busy week. I think we took these pictures in less than five minutes. Plus it was freezing outside and we did not want to be outside any longer than necessary. I know, bad blogger. And now enough about me, and onto the the Fabulous Friday Link Up! Jennie and I each picked our favorites from last week's link up. My pick is Rachel from Threads of Thomas. I absolutely loved her fun faux fur vest! You will need to visit Jennie's blog to see her pick! Thanks Sarah! Hopefully we'll get moved back into our bedroom this weekend! Love the over the knee boot! You may have been rushed off your feet but you still put together a polished look, Amy. I do admire those who put a nice outfit together in sub zero temperatures so well done you. We have about +9-10 c at moment so no chance of pretty snow. Longing to see your finished bedroom! Awww, thanks! I feel we are the only place in the world where it is still cold and snowy. All the other blogger fashion photos I see there is no snow in the background! Great outfit, love the plum colored sweater! This is a fabulous look on you! That purple cardigan is a gorgeous color! I love the cardigan! The OTK boots and hat are fab! Thank you so much for co-hosting with me this week, Amy, as well as for all the kind words you shared. I really like this casual look and how the OTK boots and ruffled cardigan give it such a nice polished feel. The color of your cardigan is beautiful and looks great on you! Thanks Jennie, and thanks for asking me. It was fun! Thanks for hosting! Love the OTK boots with this look. Sounds like a super busy but productive day for you. Love the deep purple on you! It's a great casual look. Fab hat. Great casual look, I love the purple cardigan.